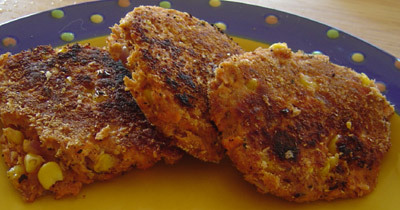 These salmon patties are quick and easy to make, and they taste great! They use simple ingredients that you probably have in your cupboard right now. I like to use canned sockeye salmon, because I find it more flavorful. This recipe also works well with the more economical pink salmon - or you could compromise and use one can of each. Canned salmon includes bones, which are a good source of calcium. They are soft enough to eat. Just mash them well with a fork. With a fork, flake the salmon into a bowl. Use the fork to mash any visible bones. Add the eggs, first amount of bread crumbs, corn, onion, cornmeal, salt and pepper. Using your hands, form patties, using about 1/3 cup/80 mL per patty. Put the second amount of bread crumbs into a shallow bowl. Dip each patty into the crumbs, turning it to coat both sides, and place it into the skillet. Cook a few minutes on each side, until browned. Use any sweet onion in place of red onion. If you don't have cornmeal, just increase the amount of bread crumbs. Use these patties as burgers! Serve them on hamburger buns with your favourite condiments. I store bread crumbs in the freezer, where they stay fresh for a long time. Return from salmon patties to fish recipes.